Daily deal sites can provide offers and discounts available from user’s local stores or restaurants. In the past, to retrieve user location, we might need to provide a list of locations for users to opt-in, or rely on the device IP address to make a rough estimation of their location. 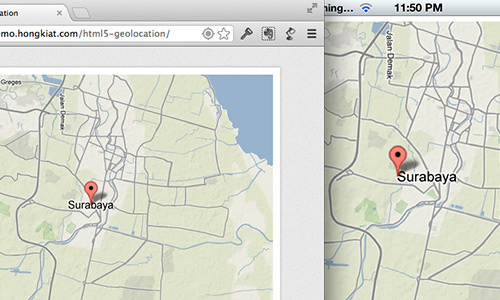 Today, we can do this job in a much leaner way with less complexity using Geolocation API. The Geolocation API is a new technology that’s introduced by W3C – the same organization behind HTML5. Probably for that reason, it is often correlated and grouped with HTML5 in many books and references, although it has actually nothing to do with HTML5 technically. In this post, we are going to use the API in its simplest form; we will create a set of functions to retrieve user’s location and show it in map with Google Maps. Let’s take a look. Then, we set up the map and the location marker accordingly with google.maps.Map and google.maps.Marker, as follows. title: "This is your location"
Then, we create a function for the error report when the location cannot be retrieved. 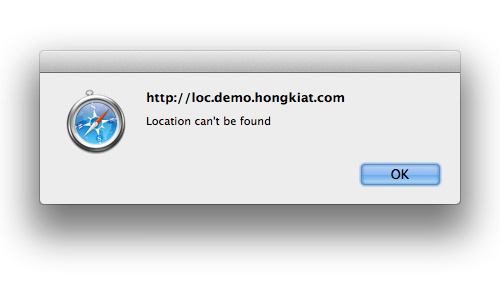 In this case, we will show an alert window saying “Location can’t be found”. The Geolocation API is quite simple. It specifies with the navigator.geolocation object, as you can see from the following code. In the above code, we will first run a test whether the user’s device has support for Geolocation API. If it returns “no” we will show an alert window showing that “The browser does not support Geolocation”. If it does, we will try to retrieve the location using the getCurrentPosition method. When the location coordinate has been retrieved, it will send the data to GoogleMap function, to show in the map. If the location cannot be located, the showError function will be executed instead. User agents must not send location information to Web sites without the express permission of the user. For this reason, the browser will first prompt the users whether they Allow or Deny for the browser to track their location information. In the following screenshot I tested the above code in my Macbook and iPhone. It turns out that the iPhone shows a more accurate location than one at my MacBook, as it is equipped with GPS hardware. Lastly, head over to the demo page to see how it is in action.